Two months ago my friend Beth and I started working at a café together one day a week. We bring our laptops and our to-do lists and we spend a few hours doing all kinds of tasks – responding to emails and texts, working on writing projects, doing research, etc. Now and then we stop to chat, ask each other questions, get up and stretch, or share interesting information. I know this practice isn’t new. I see plenty of self-employed people working around us and I’ve even done it myself in the past now and then, but never consistently. It’s become a regular appointment in my calendar and I schedule other activities around it as best I can. I can’t believe what a difference this one change has made to the quality of my life. Routine can be good mental self-care. During the week, when I start worrying about getting back to people or meeting deadlines, I remind myself that it’ll get handled on Wednesday. The moment I do this, I can feel my nervous system downshift and my body relax. My weekly work date saves me time and energy, too. I no longer check email off and on throughout the day or feel compelled to respond to someone so I don’t forget or to take it off my plate. Knowing I’ve set aside time for these activities gives me the freedom to tend to other things without being distracted or disrupted by stops and starts. And then there’s the blessing of being less tethered to electronics . I get my work done. I have fun doing it. And I feel a delicious sense of completion and spaciousness at the end of the day. It’s quite surprising how you can easily teach others to expect a response to their requests in a reasonable amount of time rather than within hours. Not only that, but something else wonderful has happened. Being a writer and solo entrepreneur can be lonely sometimes. Especially in the winter. The best part of my weekly café date is the friendship that’s developed between Beth and me. It’s a pleasure to work side-by-side with someone who shares my temperament, timing, and work style. Throughout the day, as we sip tea, type away, and share funny stories about our life and work, I’m reminded that we are creatures built for relationship, for belonging, and for co-creation. Life is so much easier (and more enjoyable!) in the company of friends. PPS – This week’s Facebook Live will be held on Wednesday, March 20th at 6pm EST/3pm PST. 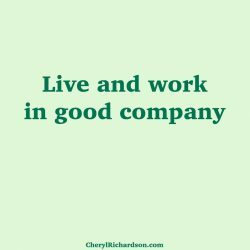 You can join me here and also watch past sessions on my YouTube channel at CherylRichardsonTV here.